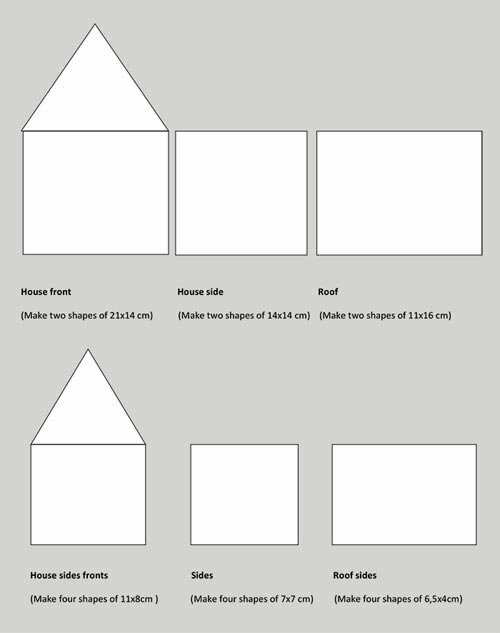 Draw the pattern as shown in the 'Haunted House Plan' on grey chip board/ sturdy cardboard and cut out with a stanley knife / sharp blade. 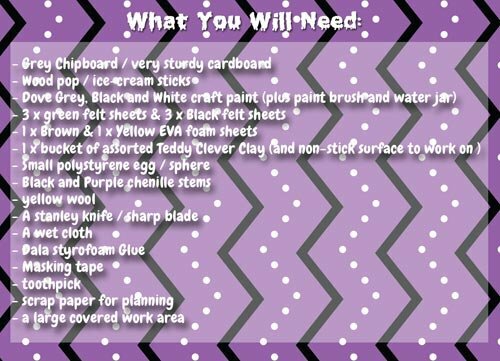 Stick the wooden popsticks / ice-cream sticks onto the board with Styrofoam glue and allow to dry (10 minutes). Cut the shapes out with a Stanley knife / sharp blade. Assemble the panels with masking tape. Glue the insides with Styrofoam glue. Assemble all segments separately and then stick together on the base. NOTE: The pictured sample shown was done with an airbrush. You can however achieve a similar result with normal brushes. Mix a dark grey using Dove grey and Black craft paint. Spray / paint all along the lines where the sides of the meet. Mix a medium grey (roughly two shades lighter than your previous colour) and spray/paint in between the dark lines. Mix a light grey (again two shades lighter) and lightly spray/paint the entire house. Paint in between all the lines where the sticks meet and all gaps with black paint. Very quickly wipe it down with a wet cloth. Remember to work fast as craft paint dries very quickly. 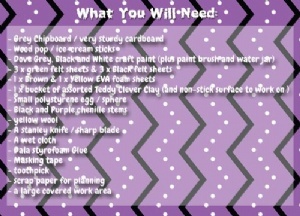 Also - do not wipe all the paint off. The idea is to let the black sit in all the crevices and to create a 'weathered' look. Cut an A2 size board from your remaining grey chip board and stick green onto one side for the grass and black for the night sky. 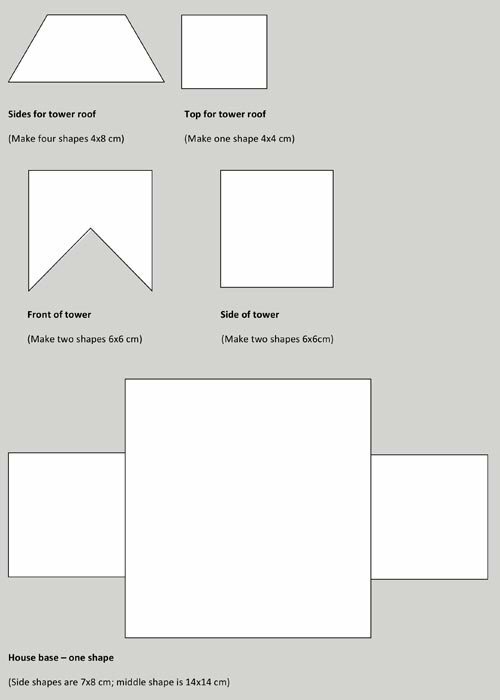 On the brown EVA foam sheet draw a tree silhouette and cut out (Use the entire length of the sheet - 30cm). On a yellow foam sheet cut out a large moon (about 7cm in diameter). From black felt cut out tiny bat shapes - one must fit onto the moon. Stick onto your black felt portion of the backdrop as shown. Cut grass blades from the green felt to cover the bottom of your tree trunk. Cut two rectangular windows (4cm x 5cm) and three round windows (4cm in diameter) from the yellow EVA foam sheet. One round window will go on the front of the house, and the remaining two round windows at the sides of the tower. Cut a door shape from the brown EVA foam sheet (4cm x 5cm). Paint the words "BEWARE" on the front door with runny white craft paint. I got it to run slightly by blowing very hard on it. Cut a cat silhouette out from the black felt and stick onto one rectangular window to look as if the cat is sitting on the windowsill inside the house. Mix a bit of grey clever clay by combining (red, green and purple) and roll into a thin sausage. Frame / outline the windows with this. Roll a thicker piece for the bottom window sill. Glue both to the front of the house. Now create some simple ghost head and arms shapes and stick these onto your other rectangular window. Then cover the sides with the grey clay as before, and stick onto the front of the house. Frame your round windows and stick to the house. To create the tombstone I used left over previously mixed grey clay. I rolled a ball and flattened it, squaring out the bottom to create the shape. I used a toothpick to put the letters "RIP" on it. For each pumpkin mix red and yellow clever clay to create orange, and roll six evenly shaped balls. Then shape these into half moon shapes. Now press all six pieces together. Place a flat round piece of orange clay over the hole at the top and roll a small brown stem (mixing red and green) and put it on the top of your pumpkin. Next roll out very thin green sausage shapes and spiral them for the pumpkin vines. Lastly, make some green leaves and place them as desired on the top of your pumpkin. Roll very long and very thin white clever clay sausages. Cut five straight pieces (10cm in length) and lay them out as shown. Create scallop shapes with the rest and gently stick this together. Leave the cobweb to dry completely before you glue it to the roof of the house (about 30 minutes). Separate white clever clay into portions as shown. 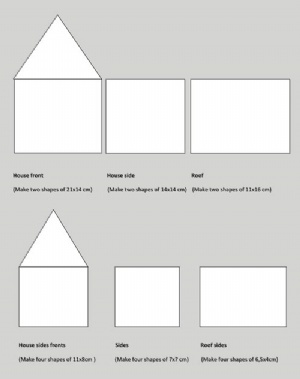 Shape the portions into shapes as shown. Assemble your ghost from the shapes. Place him on the left or right side of the 'small' roof as if he was peeking over. Remember to paint his face on with black craft paint when he is dry. Cut the top off a small polystyrene egg/ sphere shape. Cover it in the grey clever clay and cut the excess away leaving a but to create the rim of the cauldron. But first, turn the shape over and place a round green piece of clever clay on the exposed Styrofoam area. Fold the extra clay over to create the rim - be careful not to cover the green up! Roll a thick grey sausage and attach it onto the top of your witches' cauldron for the brim of the pot. Decorate the top of the cauldron with the white fun foam to create the bubbles running out over the pot, or, alternatively small balls of white clever clay would work too. Roll three, small, evenly sized grey balls and place it on the bottom of the cauldron for feet. For the broom: twist black and purple chenille stems as shown and cut some lengths of yellow wool (7cm in length). Fold these in half over the chenille stem twist as shown. Pull all the wool through the bottom loop and tighten up the loop. Now twist the chenille stems to form the brooms handle. Make tiny black chenille stem spiders and stick them around your haunted house. Glue some small googley eyes onto them too. You can also use as many of your previously cut bat shapes as you wish, placing them around the top of your house. Place your pumpkins, cauldron, broom and tombstones as you like in front of your house. 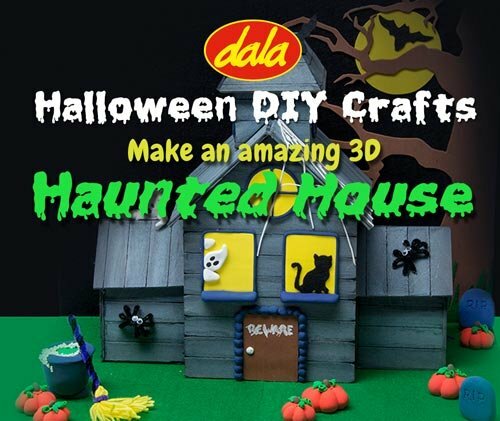 Now your haunted house is ready to scare and amaze! This item has 862 views.